Visit Washington, D.C. at the perfect time of year! 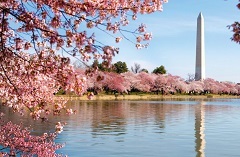 Taking place each year in the spring, the National Cherry Blossom Festival commemorates a gift of Japanese cherry trees from Mayor Yukio Ozaki of Tokyo City to the city of Washington, D.C. on March 27, 1912. This year's festival will be held from March 20 to April 14, 2019 with the parade on Saturday, April 13, 2019. Come stay with us and enjoy cherry blossom season! This rate is available for stays from February 22, 2019 to April 22, 2019.